You will receive the complete Cornell Soil Health Assessment Report in 4-6 weeks. These results will be sent from the Cornell Soil Health Lab in the Cornell Nutrient Analysis Lab, G01 Bradfield Hall, 306 Tower Road, Cornell University, Ithaca, NY 14853. Phone 607-227-6055. 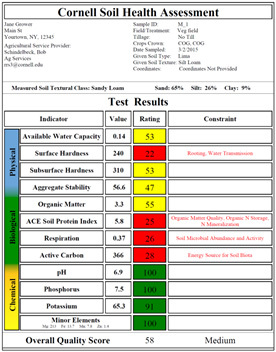 The Cornell Assessment of Soil Health Report includes the summary page (right) plus ten more pages with short narrative descriptions of what each indicator means, suggestions for prioritizing management of constraints, and a table of management guidelines by indicator. 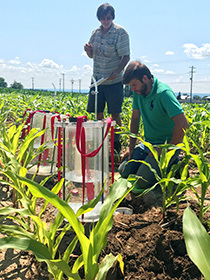 More details on interpreting results can be found in the Soil health assessment report section of the Comprehensive Assessment of Soil Health – The Cornell Framework Manual.